At dawn on September 10, 1906, the steamship, S.S. China, docked at Honolulu. The ten-day trip from Yokohama had been uneventful. The Pacific Commercial Advertiser Daily, commenting on the China's arrival, noted that the ship carried eleven cabin passengers, the lowest in the history, 309 Japanese and 9 European immigrants in steerage. One of the passengers in steerage was a young man named Seishiro Okazaki. Seishiro was sixteen when he arrived in Honolulu. He was the fourth son of Hanuemon Okazaki, whose family traced its roots back sixteen generations to a Samurai family. The family probably moved from Nagoya to Kakedacho some time after 1868, after the Meiji government had abolished Japan's feudal system and, in effect, the Samurai class. When the family moved to Fukishima, they were wealthy, but Hanuemon Okazaki, Seishiro's father, was not fortunate. Several business ventures failed and by the time Seishiro was born, on January 28, 1890, the fortune that the family had once possessed was all but gone. As soon as age permitted, Seishiro was apprenticed to a local businessman and by fifteen, plans were being made for him to leave Japan for Hawaii. this was a time of heavy Japanese migration. Hawaii was seen as the land of opportunity and the lure of new land and a new start may have been irresistible. If Okazaki's later life is any indication, it is obvious that he liked to travel, as he found new people and new places stimulating. For whatever reasons, in late August of 1906, he made his way south to the port city of Yokohama, bought a ticket on the S.S. China and on the morning of September 1, watched the Japanese coast disappear as the China steamed towards Hawaii. He would not see Japan again for eighteen years. Okazaki arrived in the Hawaiian Islands at Honolulu. Many of the Japanese immigrants found work in the cane fields and Okazaki was no exception. He went to work for the Ewa plantation. he was not a particularly robust man. Tallish and slim, and with what was probably asthma, Okazaki did not find the hard and dusty work of the plantation appealing or healthy. He left the Ewa plantation and took a job, first with a local store, called Yoshimura's and then with Hoffschlaeger's, a local wholesale company, before he left and made his way to Maui. On Maui, Okazaki went to work for the Paia plantation, where he married. When Okazaki arrived in Hilo, he was not well. He had a cough and was run down. He was a doctor who diagnosed him as having a pre-tubercular condition. the doctor may have told him to take it easy and conserve his strength. Ignoring his doctor's caution, Okazaki went in search of a cure. He found it in an odd place, the Hilo Shinyu-Kai, a Jujitsu dojo, run by a martial arts master, named Kichimatsu Tanaka. Jujitsu was probably the last thing Okazaki's doctor would have ordered. The strenuous workouts, the falls, the constant battering would hardly have been a suggested cure for tuberculosis. However, within, a year, the pretubercular condition had disappeared and the tall skinny kid, according to Okazaki's own words, had developed a "body of iron". This interest in the martial arts that began in Hilo in 1909 became an all-consuming passion. The years in Hilo were busy ones. Jujitsu workouts with Tanaka-sensei were daily. When he wasn't at Shinyu-Kai, he was working. He tried a number of different jobs but Jui-Jitsu was his life. As he learned Yoshin-ryu from Tanaka-sensei he began to study other forms as well. He studied Hawaiian Lua, Okinawan karate, Philippine knife play and, from Master Wo Chong, Kung Fu. However, his main proficiency was in Yoshin-ryu, the style taught by Tanaka-sensei. In the 1970's, Dr. John Masuhara conducted interviews of selected elderly/retired/senior ju-jitsu and/or judo practitioners. Mr. Sadao Sakamoto...was 78 years old in the late 1970's when he was interviewed. Mr. Sakamoto started as a student of Yoshin-Ryu Ju-Jitsu at the Hilo Shinyu-Kai in 1918, as a teenager. Mr. Sakamoto remembered that the instructor Kichimatsu Tanaka organized the Yoshin-Ryu dojo in 1912. 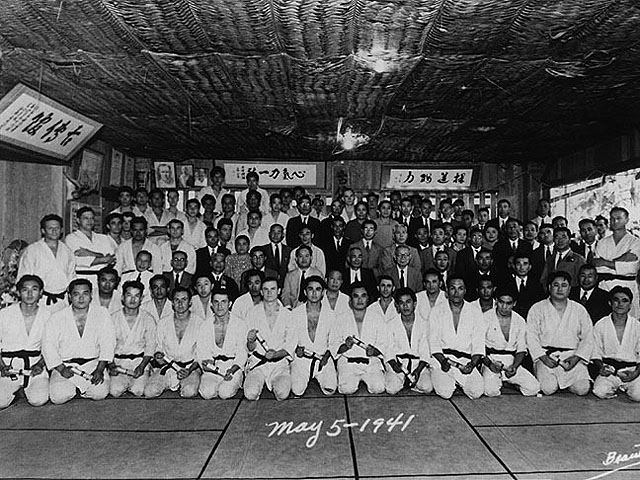 The dojo was affiliated with the Hilo Shinyu-Kai, which also promoted other sports activities. According to Mr. Sakamoto, Tanaka Kichimatsu, as an employee of the old Yoshimura Store on Ferneaux Lane in Hilo Town, apprehended a thief using ju-jitsu self-defense techniques he learned in Japan. A grateful storeowner and others in the community convinced Tanaka to start a ju-jitsu dojo in back of the store. Original members of the dojo included Okazaki Seiishiro (who later moved to Maui, then Oahu and organized a famed ju-jitsu dojo at the Okazaki gym in Liliha on Oahu ;Okazaki was instrumental in the early formation of the American Ju-Jitsu Institute; he also gained fame as a massage expert who helped an ailing Mrs. John Burns, wife of a future governor), Nakashima Kazuo, Yamasaki --?, and Inouye Teruchi. Other students who joined prior to 1919, were Dr. Chu Fook Tang (dentist),Yamato Kaichi, Inouye Kitaru (Papaikou branch), Sakamoto Sadao, and JerryYoshiyama (Waiakea branch). Mr. Sadao Sakamoto also recalled that a Nanpa-Shoshin Ryu Ju-Jitsu group was active in Pepeekeo with a Mr. Hamai as instructor (circa 1918). In the 1970's, Dr. Masuhara also interviewed Professor Tamio Kawasaki, 6th dan,...who started the Higashi Hongwanji Judo Club in 1935. Professor Kawasaki was 16 years old when he joined the Yoshin-Ryu dojo in 1923. He recalled that in 1923, much of the actual instruction at the Yoshin-Ryu dojo was being done by Okazaki Seiishiro, under the head advisorship of Tanaka Kichimatsu. At the time, Okazaki Seiishiro worked for Hoffschlaeger and later as a candy wholesaler. During his travel on business around the Big Island, Okazaki Seiishiro would stop and assist at towns where there were ju-jitsu activities. Both Sakamoto and Kawasaki stated that it was Kodokan Judo techniques that were being practiced at the Yoshin-Ryu dojo of the Hilo Shinyu-Kai during the period they were there. At the time they started (circa 1918-23), many of the older ju-jitsu techniques had already been displaced by the more popular Kodokan Judo movement in Japan as well as in Hawaii. The recovery of his health and his expertise in Yoshin-ryu made Okazaki a bit cocky. In the early twenties, he began going around the island, fighting exhibition bouts where and when he could find takers. His greatest moments came in May of 1922. In April of that year, a friend of Okazaki's, a martial artist named "Speed" Takahashi challenged a boxer, named Carl "Kayo" Morris to a bout. It was to be a confrontation between a boxer and a Jujitsu expert. Takahashi was fast and extremely proficient, but he wore glasses and couldn't see well without them. Morris took advantage of his handicap and knocked Takahashi out in the first round. Okazaki immediately challenged Morris to a bout. For the next month and a half, he trained. He watched other boxers to try to find weaknesses. A friend who worked at the Chevrolet dealership suggested that he should try to stay very low, out of the reach of Morris' punches. He used this advice. On May 19, 1922 the two men met. The fight was scheduled for six, three-minute rounds. It lasted only two. In the first round, Okazaki stalked his man, staying down in a low crouch. Theory is always less hazardous than practice. Okazaki misjudged both Morris' reach and power and had his nose broken halfway through the first round. In the next round, Okazaki watched for an opening. Morris, who had been jabbing, keeping Okazaki away, left his arm out a bit too long. Okazaki moved, driving under the boxer's arm and throwing the man. The throw and the fall injured Morris' arm and he was unable to continue. Okazaki's fame was immediate and the newspapers carried the story all the way back to Japan.
" Five minutes after the start of the mixed bout and during which time Okazaki threw Morris and himself over the ropes into the audience upon two occasions. (sic) Okazaki threw his opponent to the mat and with an arm lock which wrenched the muscles of Morris' right arm and forced him to (figuratively speaking) throw up the sponge. At first sight, it looked as if Morris' arm was broken, but after an examination by Dr. S. R. Brown, who was present in the audience, it was found that the muscles were merely badly wrenched. " After the bout, Okazaki is supposed to have visited Morris in the hospital and massaged the boxer's arm, and the two are even said to have become friends. Whatever the epitaph to the bout, the win must have certainly bolstered Okazaki's already healthy ego. In 1924, Okazaki returned to Japan and made a six-month whirlwind tour of as many dojos as he could visit. He evidently stopped at the Kodokan, tested there for rank, and was awarded his Sandan. In 1926, Okazaki was described as a "Jujitsu Instructor" in the Hilo directory. It was the first time that he had listed his passion as his profession. In this same year, Okazaki moved from Hilo to Maui. In 1927, in the Maui directory, he was listed as "Professor Henry S. Okazaki, Restoration Massage." It is the first time that the name "Henry" appears and the first time Restoration Massage appears as his business. in actual fact, he had been studying massage along with his training in Yoshin-ryu. The move to Maui was the beginning of his life's work in both these areas. Okazaki left Maui in 1929/1930 and, once in Oahu, rented a house on South Hotel Street. The house which was called "Nikko," was of Japanese design. Okazaki bought the house in the 30's and Nikko became the center for Dan Zan Ryu for the next twenty-one years. However, Okazaki's first order of business was not Jujitsu. Jujitsu had never provided him with much of an income. He had made his money from his ability with massage. On Oahu, he would establish a physical therapy business first, Jujitsu would come later.
" I was watering the Japanese garden one day in my shorts. I was a skinny, puny kid. He was watching me and he says, "Take a fall." And I looked at the grass I was standing on and said, "Gee, there's not enough room." And he said, "No, on the concrete." I looked at him and said, "There's no Tatami!" He blew his top and said, "Out on the street are you gonna tell a guy, Wait till I get a tatami?" So I took a sutemi because I was an obedient son and I wanted to impress him. I could feel all my bones go crunch, crunch on the concrete. " " Finally, about a couple of years later he was able to buy a tatami and that was when the class sizes increased. But on the concrete it was a lot of fun, nobody got hurt. If it rained it didn't matter and if you threw a guy, he'd just skid on the concrete. It was a lot of fun. After he bought the mats, we got dislocated necks and pulls and all that. As long as we were on concrete, we were fine. " Japanese community. But he persevered, even teaching during the war years when Japanese were not well thought of, nor well tolerated. His work schedule was the schedule of two men. He'd start his work day around 7 AM and massage clients until 10 PM, with breaks for Jujitsu practice. After he finished the massages or the Jujitsu class, he would go out and massage invalids, people who could not come to him By 2 AM he was home again where he would drag his son out of bed. Half-awake, Hachiro would massage his father's hands and feet so he could sleep. The Nikko Restoration Sanitarium and the Dan-Zan-Ryu dojo would become landmarks in Hawaiian history. When Franklin D. Roosevelt came to the Islands in the 30's, Okazaki was called in to massage him. When John Burn's (future governor) wife developed polio in 1935, it was Okazaki who took her on as a patient. Okazaki worked with Mrs. Burns for several years and, in 1936, when she decided to have a third child, against all the best advice of the local obstetricians,it was Okazaki who helped her through her pregnancy, constantly massaging her and providing encouragement. Ch 3, copyright November 1980, First Edition, signed by author. The Professor had special sessions at his home now and then. He would only have three or four trainees at each session. One Sunday afternoon he was demon strating ki when a rooster crossed the lawn about 20 feet away from us. He turned to us and asked if we liked chicken hekka. We all said yes. He cupped his hands in front of his mouth and bellowed out the expression “Kiai” at the rooster. The bird fell and lay there flexing its musc1es for a few seconds, and then died. He called Mrs. Okazaki who came out and picked up the bird, and later that afternoon we had the best chicken sukyaki I have ever eaten. After the meal we sat there on the lawn talking when one of the boys noticed a large rat running through the hibiscus hedge. He pointed and the Professor again cupped his hands like a megaphone and yelled out another “Kiai.”. The rat dropped. I went over and picked him up - he was dead. The Professor had killed these two (the chicken and the rat) at over 12 feet away just by use of his ki. his skill and the recuperative powers of the human body were the tenets of Okazaki's style of physical therapy. His greatest gift was his willingness to help others. People who knew him all point to his generosity and to the time and effort he gave to those who needed it as the mark of the man. Okazaki died in 1951, but his work has continued. His method of massage is carried on by his son, Hachiro, as well as hundreds of other men and women who learned physical therapy through him. Dan Zan Ryu Jujitsu which, under Okazaki's guidance, grew to be a major system in the Islands has, if anything, a larger following today than it did when Okazaki was alive. Okazaki suffered a stroke in July 1948, from which he recovered somewhat in 1949, when he continued teaching. Okazaki died on July 12, 1951 at the age of sixty-two. He left a rich martial arts legacy which has grown and branched for more than fifty years.